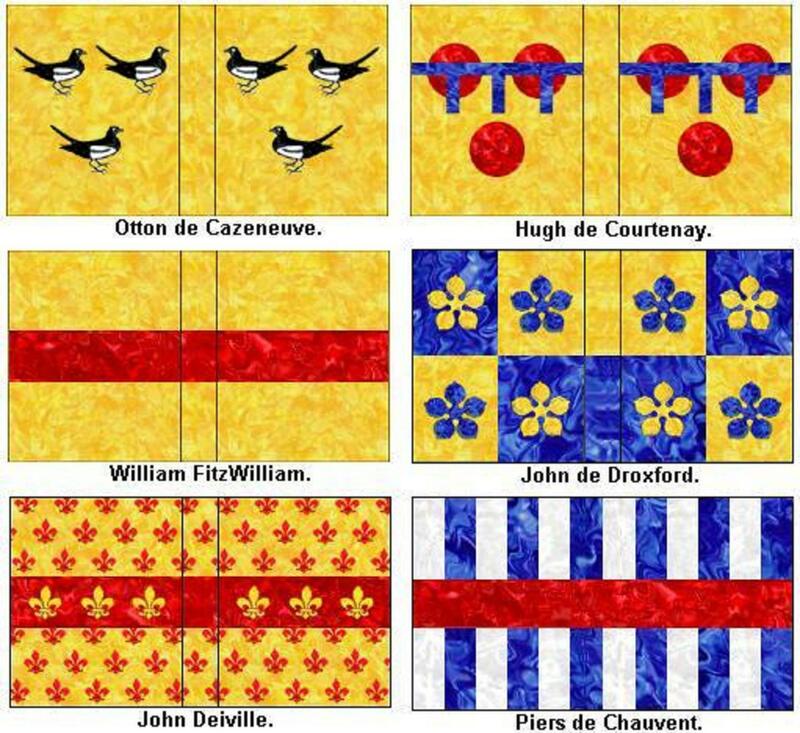 A bit of a quiet month so far. 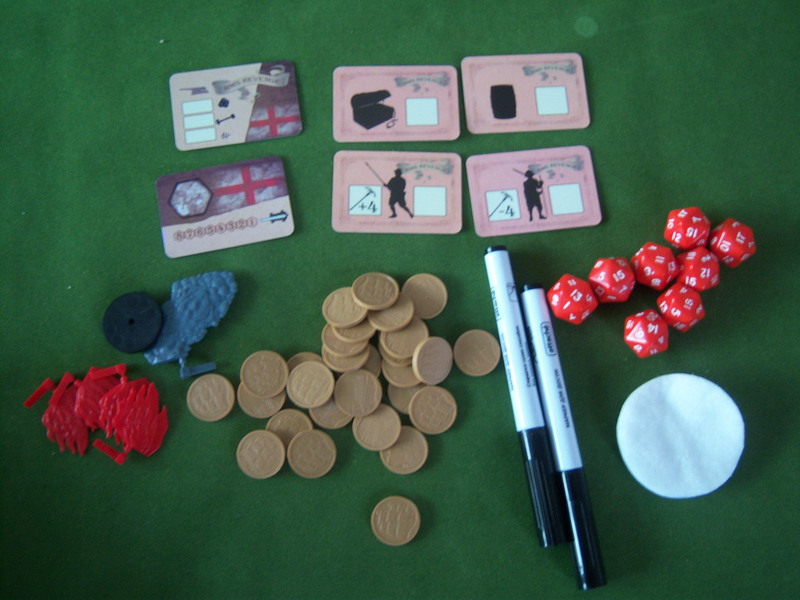 A few blogs ago I mentioned that I was having a bit of a clear out of old unplayed items. 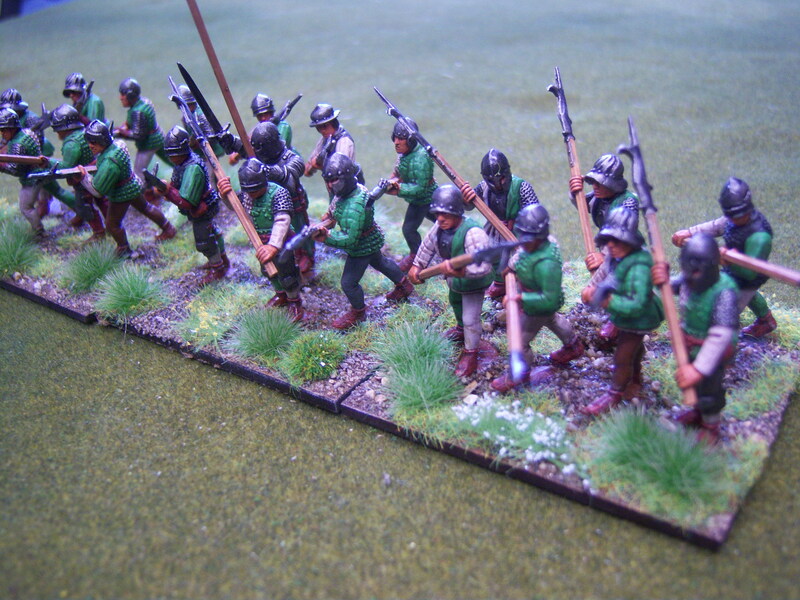 With the money raised I decided to take some of the pressure off me by getting someone else to do some painting. 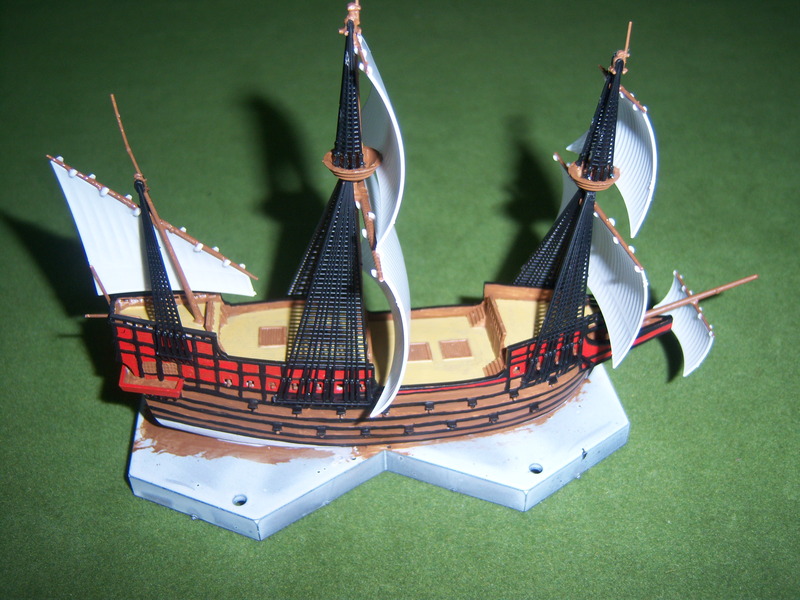 I searched for a while and found a painting service that also will supply the models. 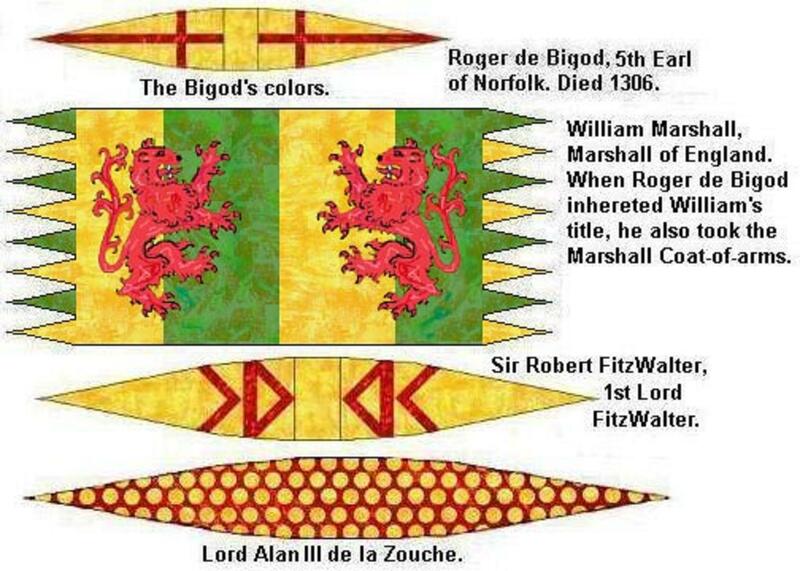 The name of the site is http://deadkingsrise.blogspot.co.uk/ and the gent who runs it is called Alan Hunter. 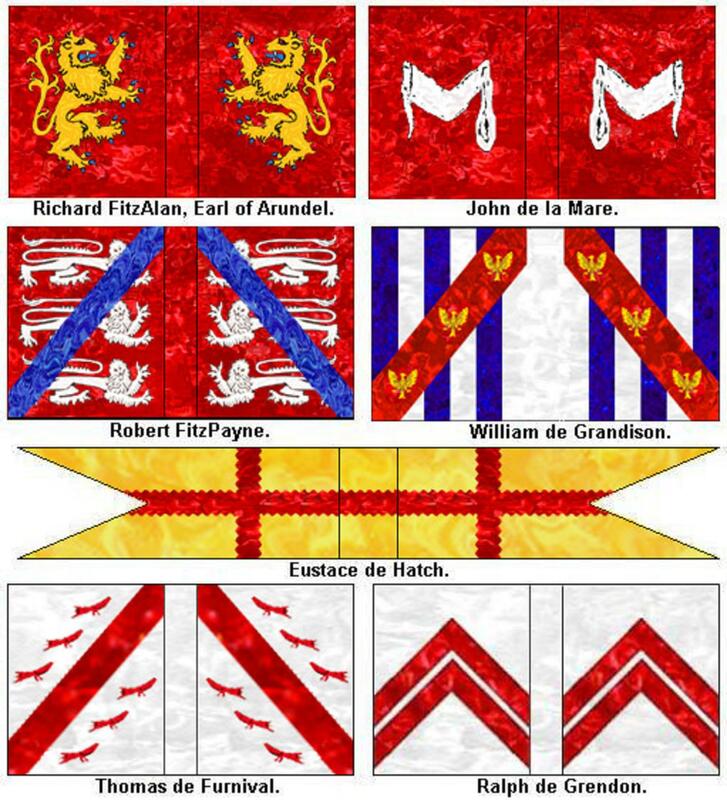 All my general enquiries where answered and Alan is so knowledgeable about the era it made it enjoyable doing business with him. 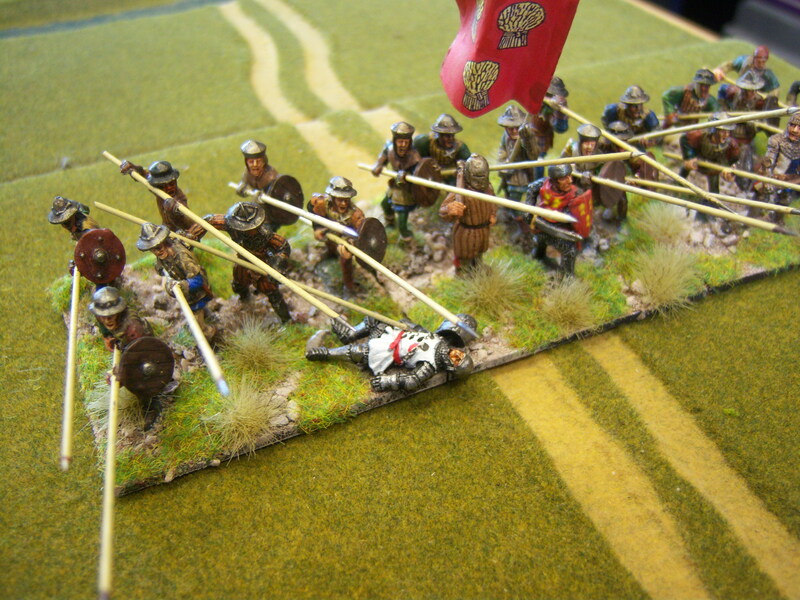 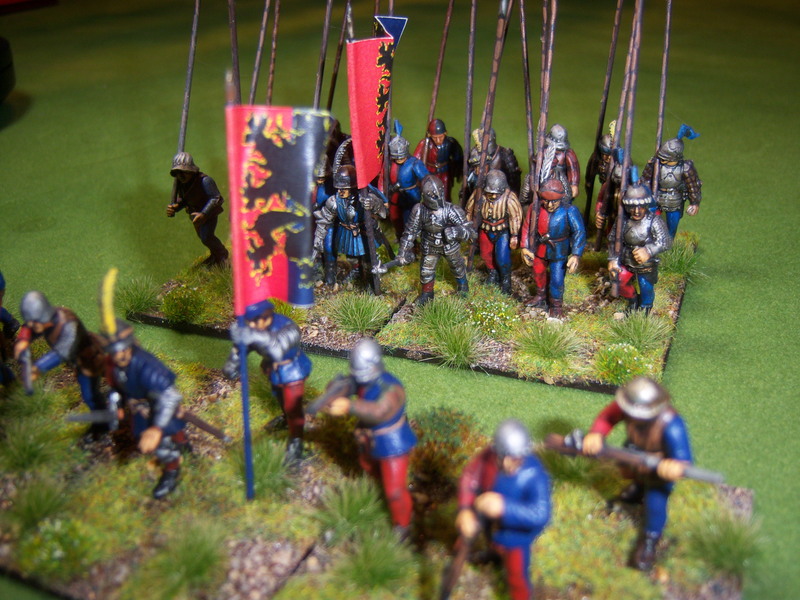 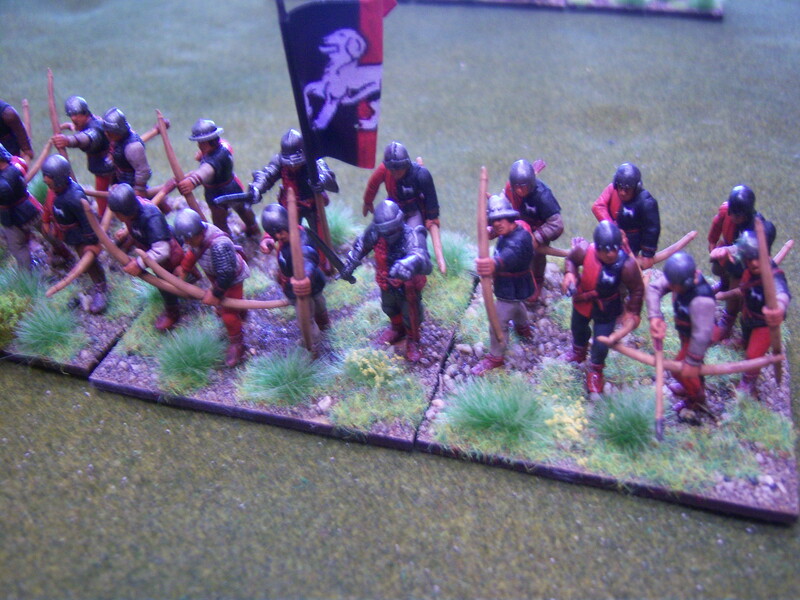 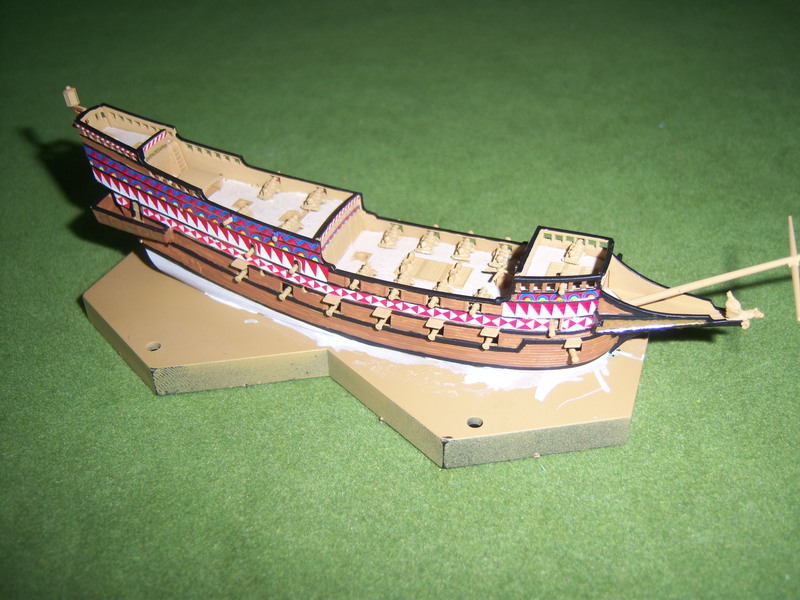 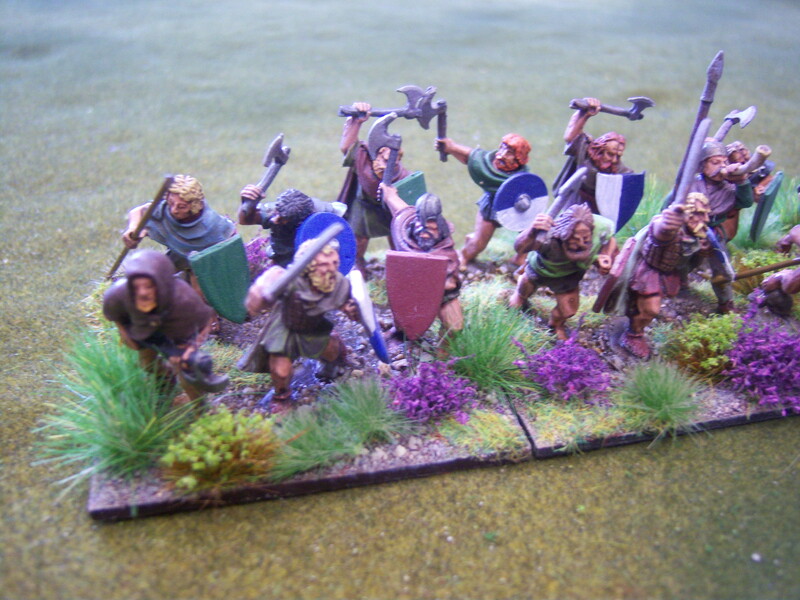 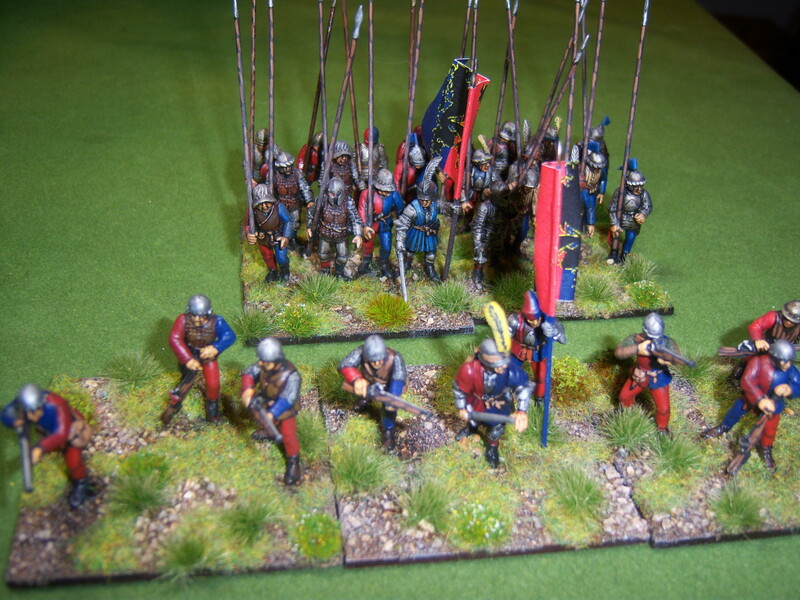 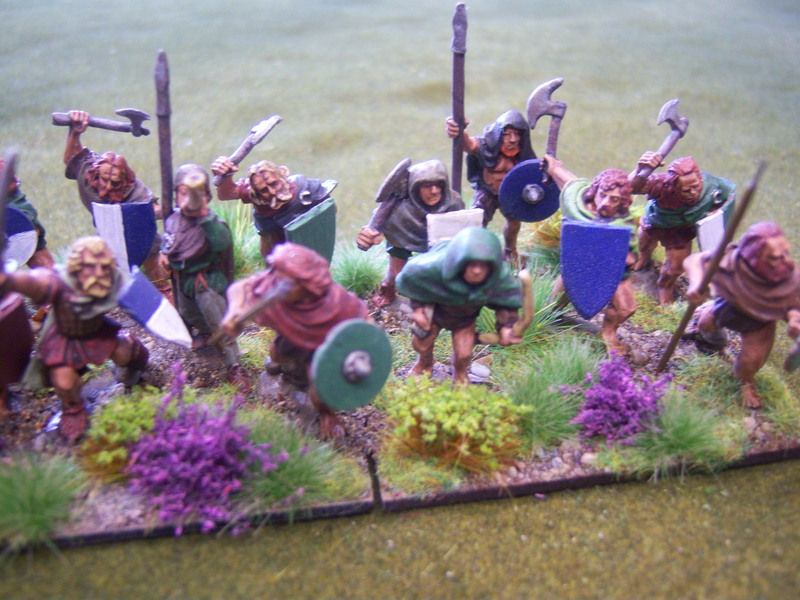 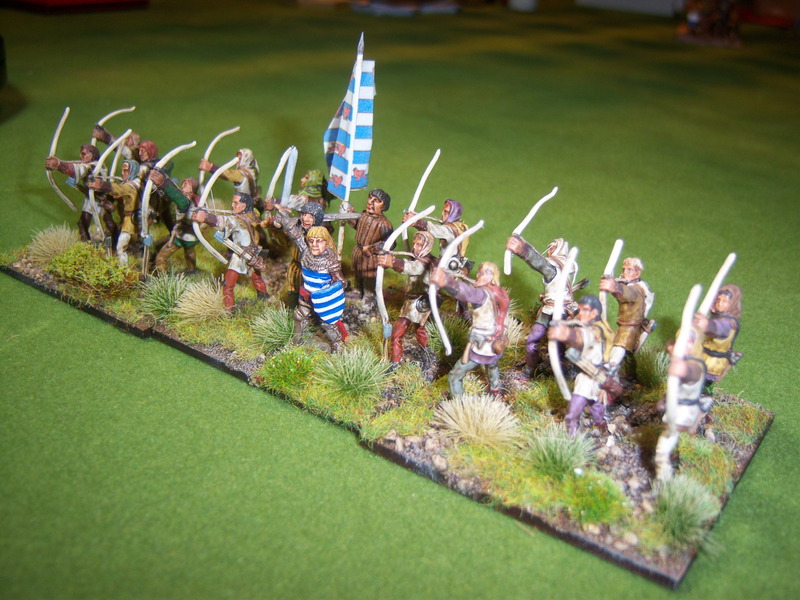 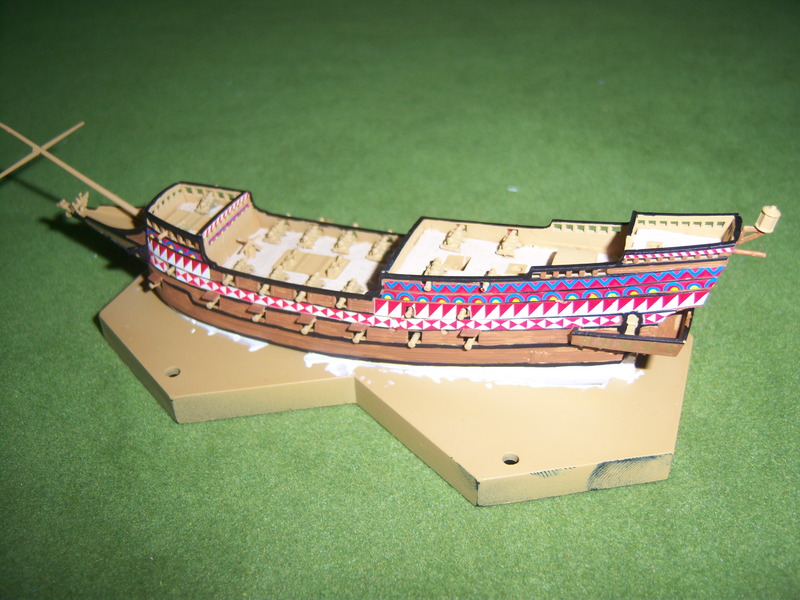 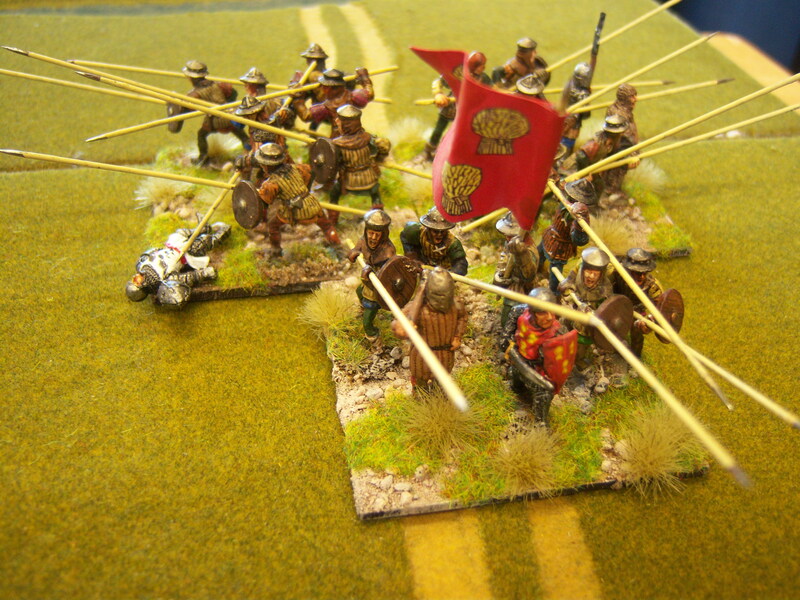 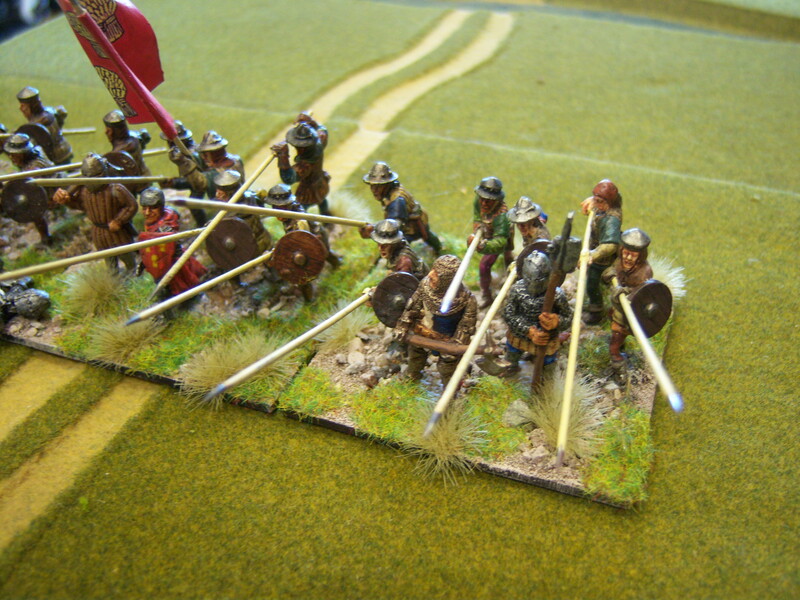 Following initial chats I commissioned Alan to supply some painted units to represent the Battle of Bosworth. 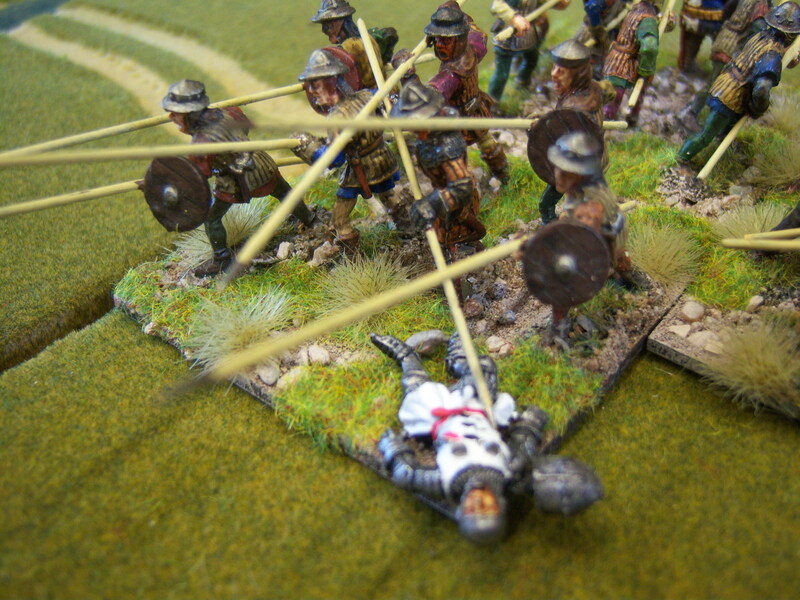 The commission will be for over 700 troops covering all combatants as well as additional units of mercenaries. 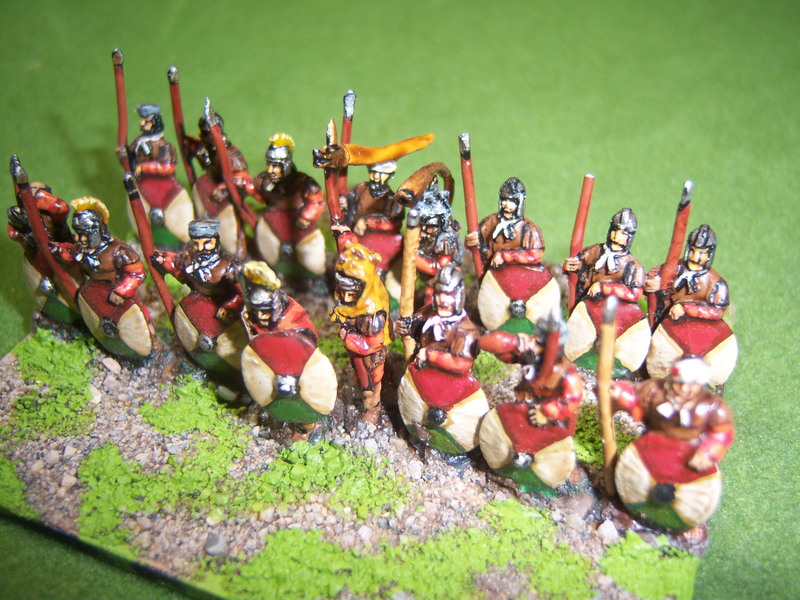 These when combined with my existing units will give me over 1200 figures. 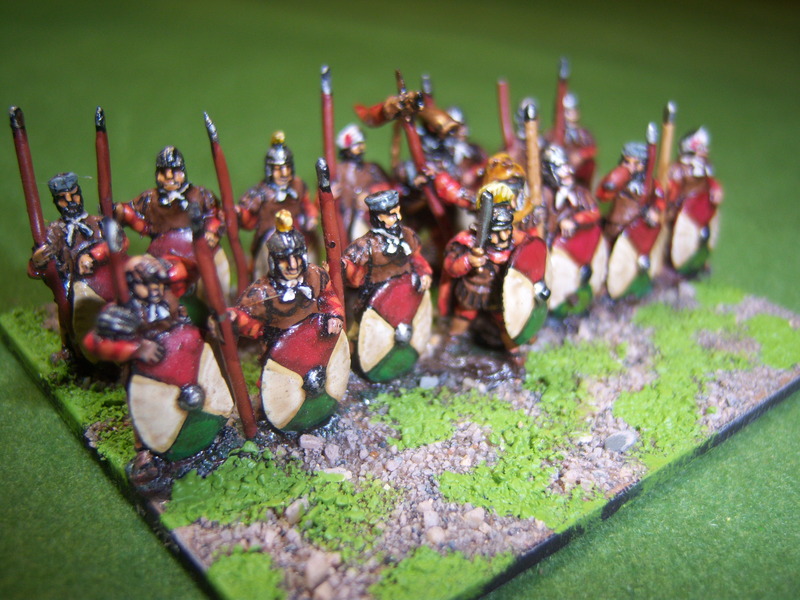 I hope to have all units completed for a game at Legionary 2015. 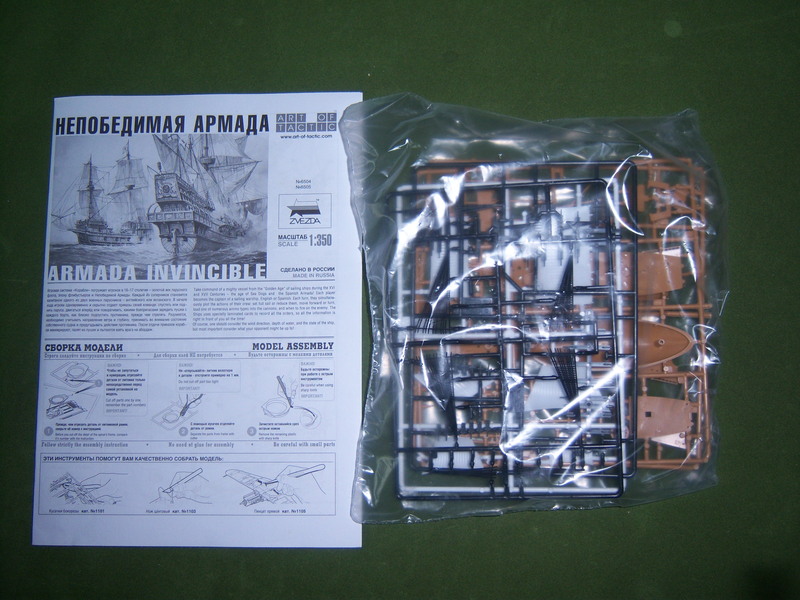 Only a few months in and the first parts of the order have turned up. 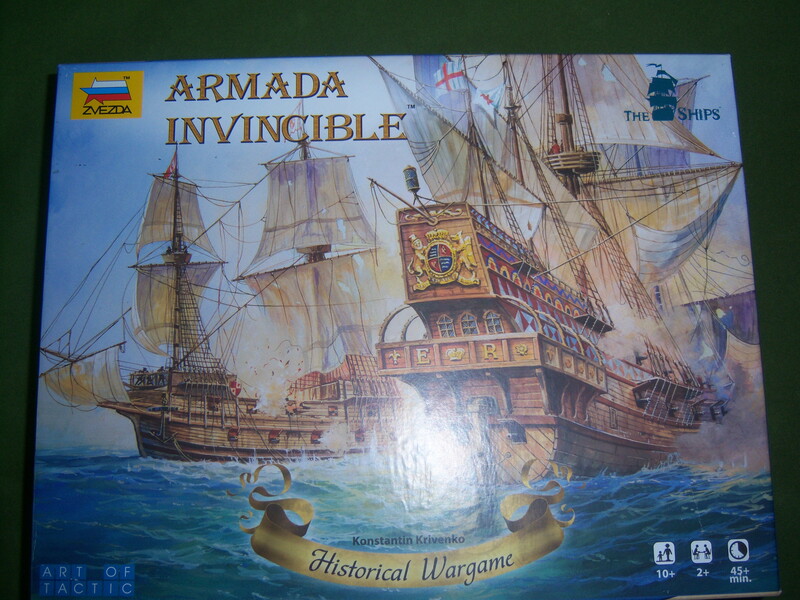 Very impressed and cannot now wait from the remaining units to arrive. 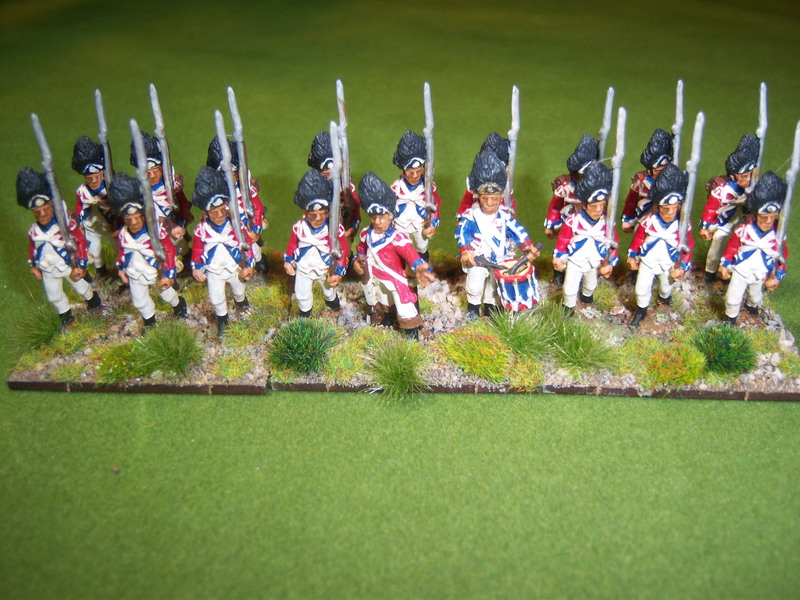 I ordered them all unbased so I can base them in my normal style. 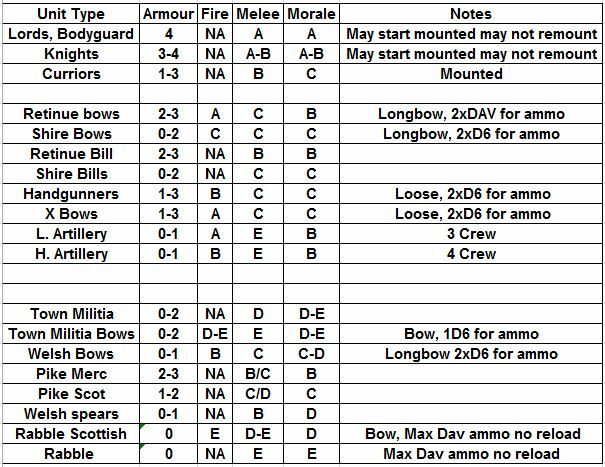 Each unit has 21 figures and there will be 3 units to a battle 1 off Bills and 2 off bows and 1 of Knights (18 figures). 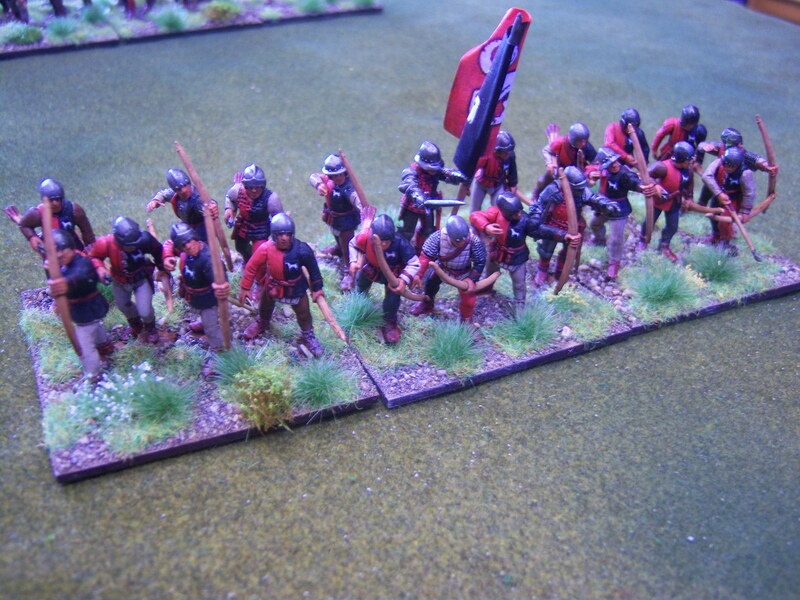 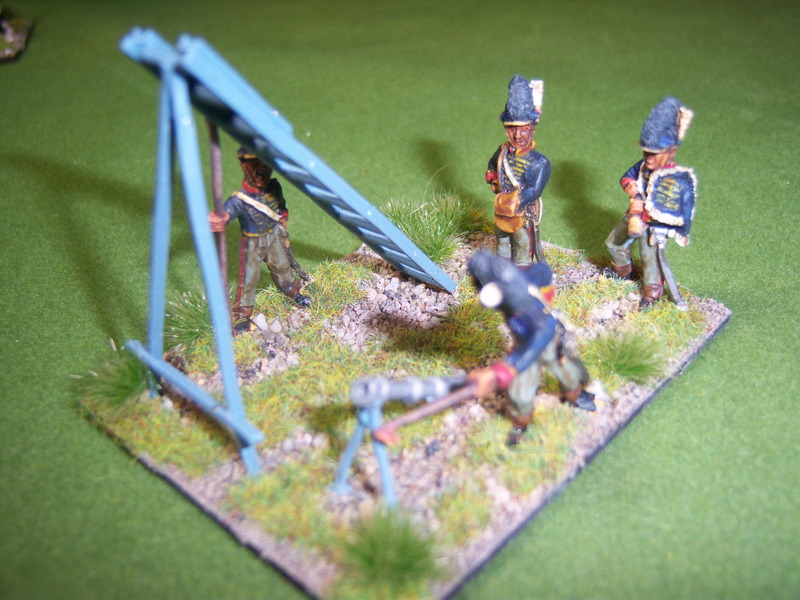 Just as the order was placed Perry launched their dismounted men at arms so timing is just right. 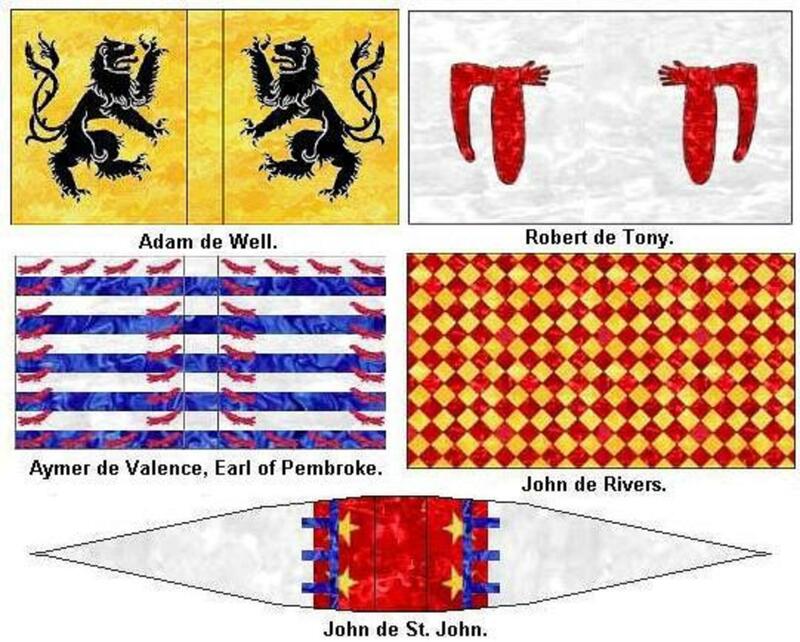 I knocked up a few flags for Talbot ( Shrewsbury). 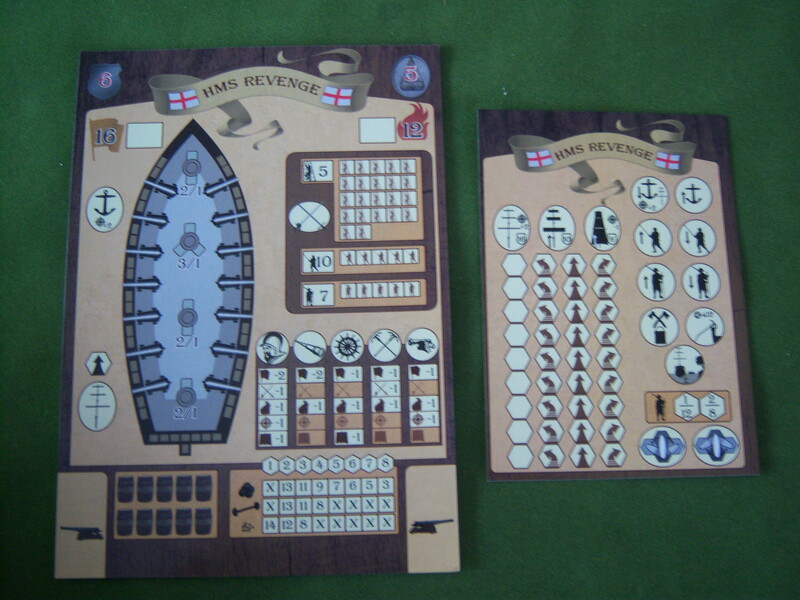 Too late I realized that I had the livery around the wrong way so will knock up another version this week. 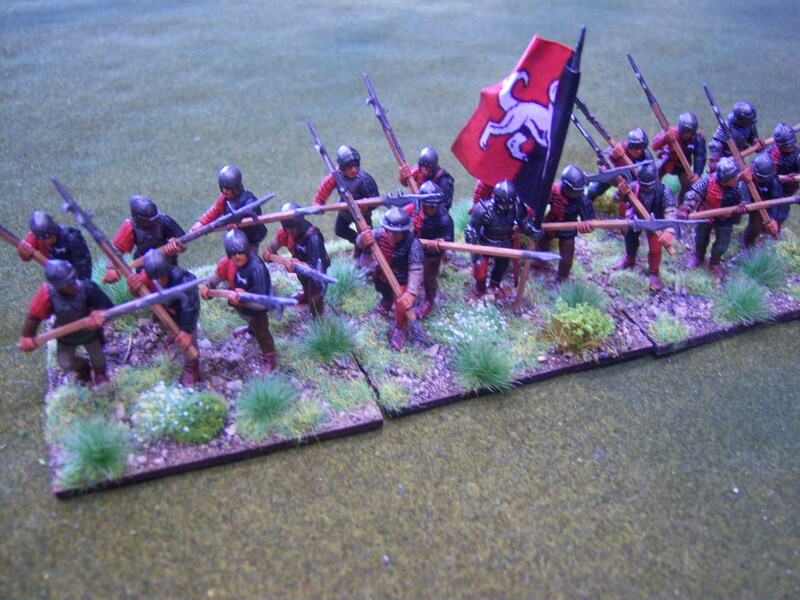 Tudor’s Bows, flags to be added. 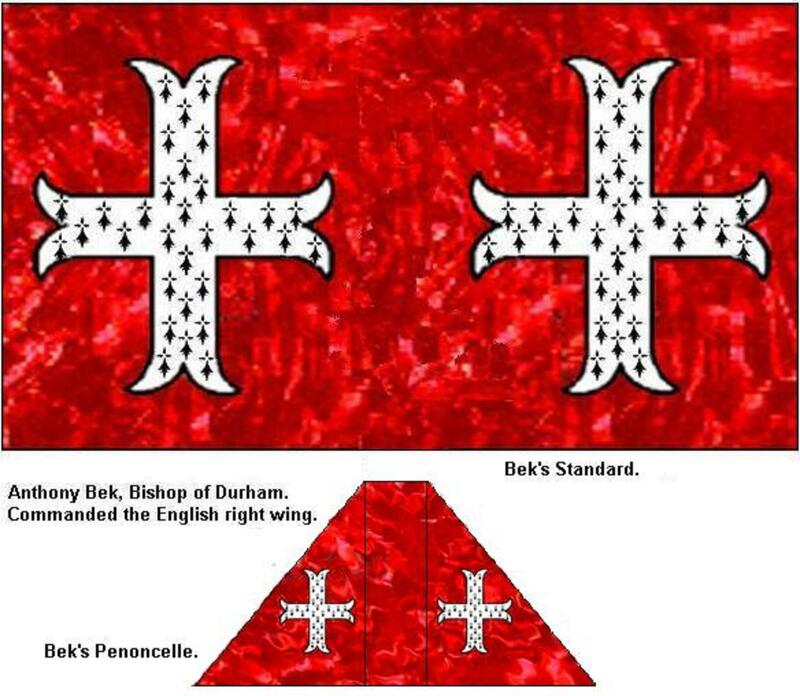 Tudor’s Bills, flags need to be added. 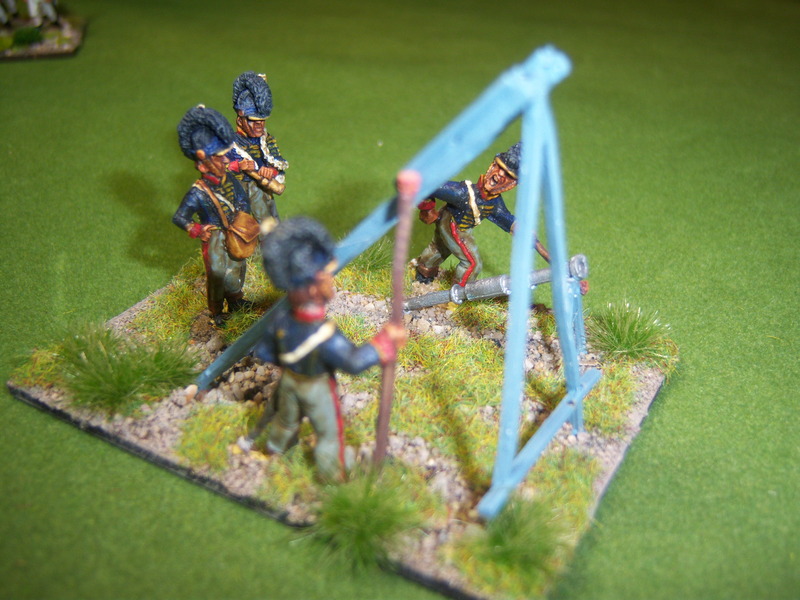 Following on from the success of the first game. 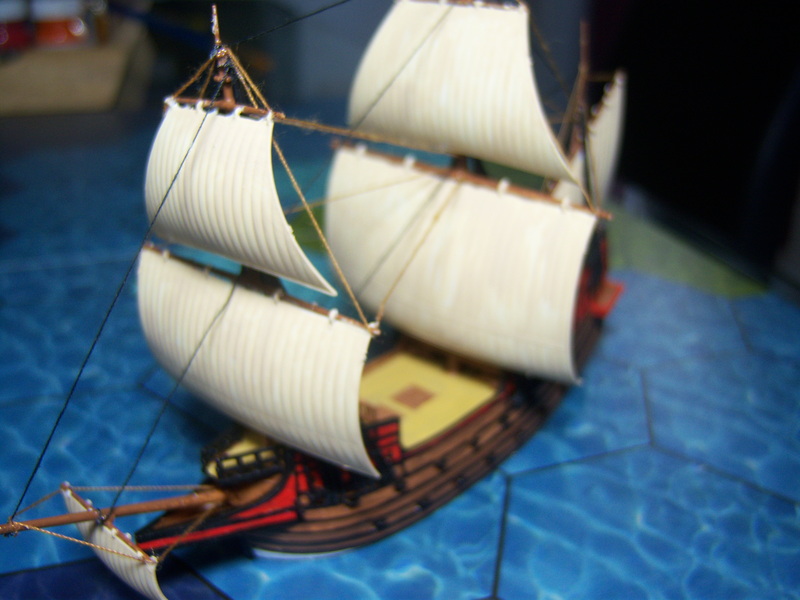 I have pressed on finishing the models. 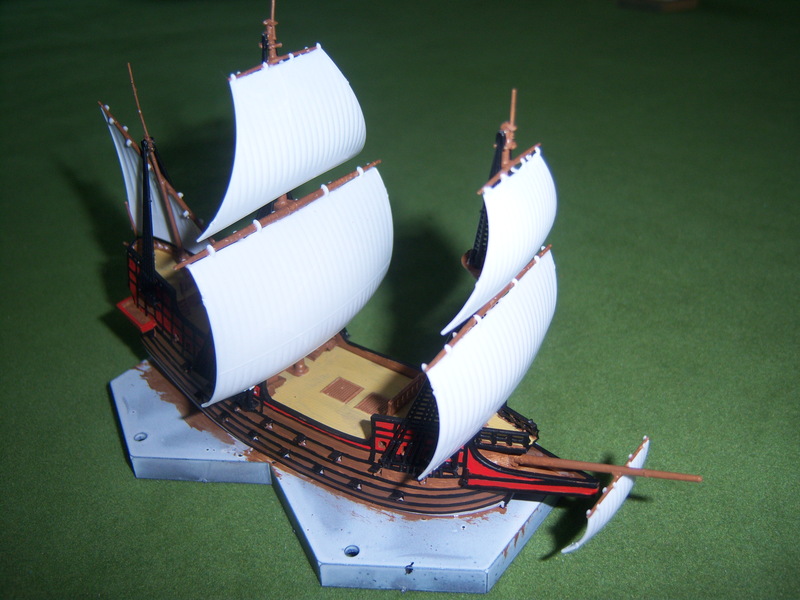 Both models have been rigged and are ready for a detail wash and transfers added. 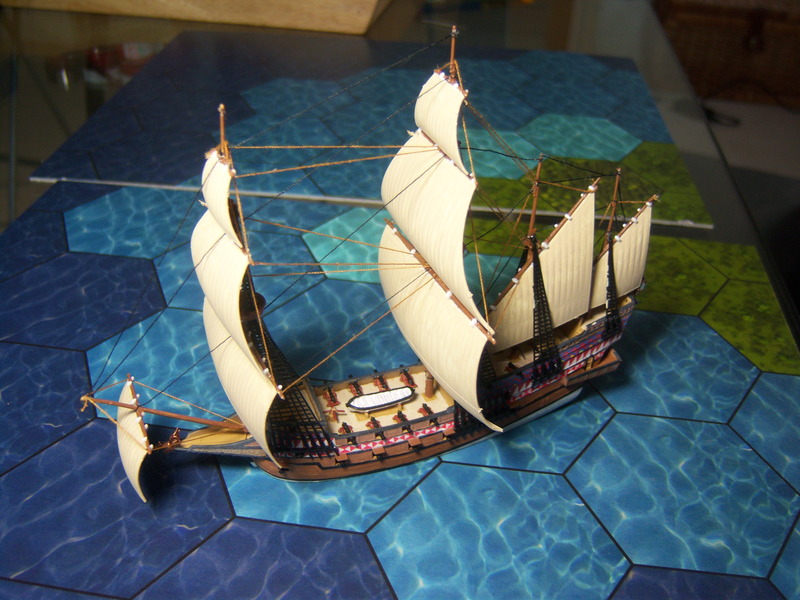 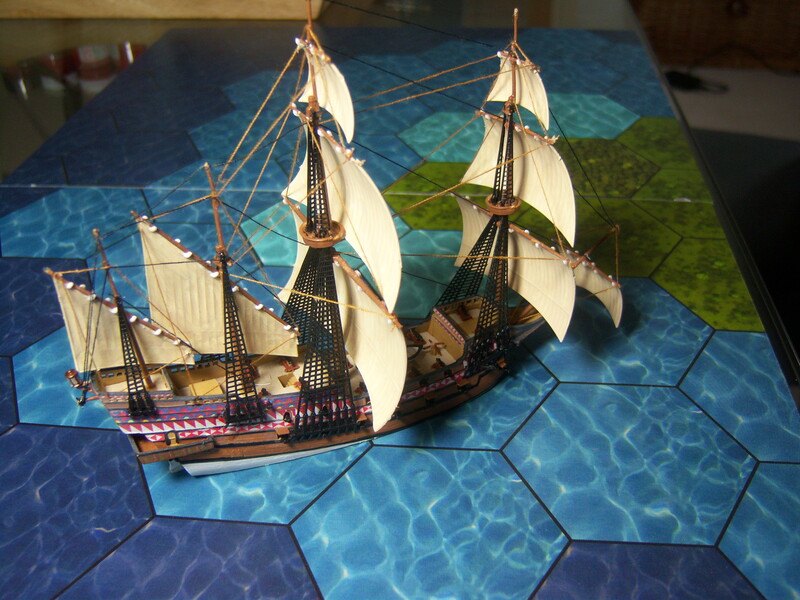 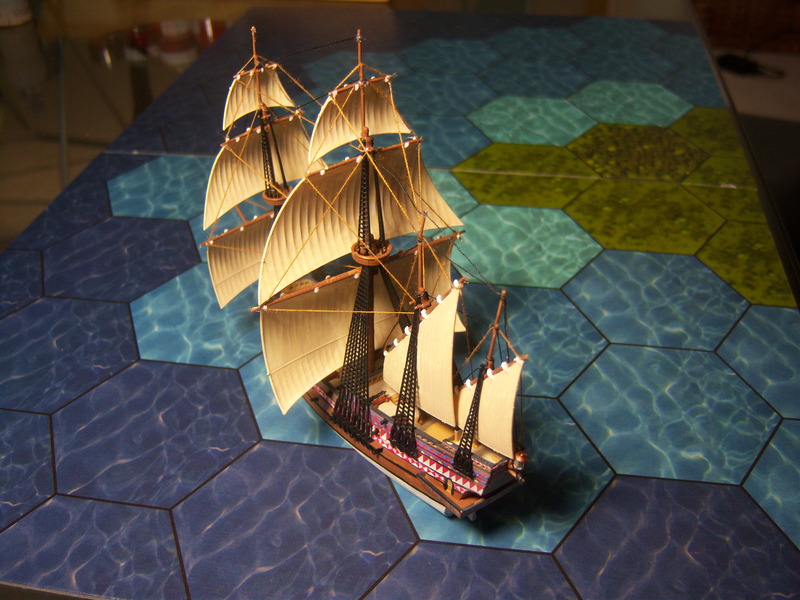 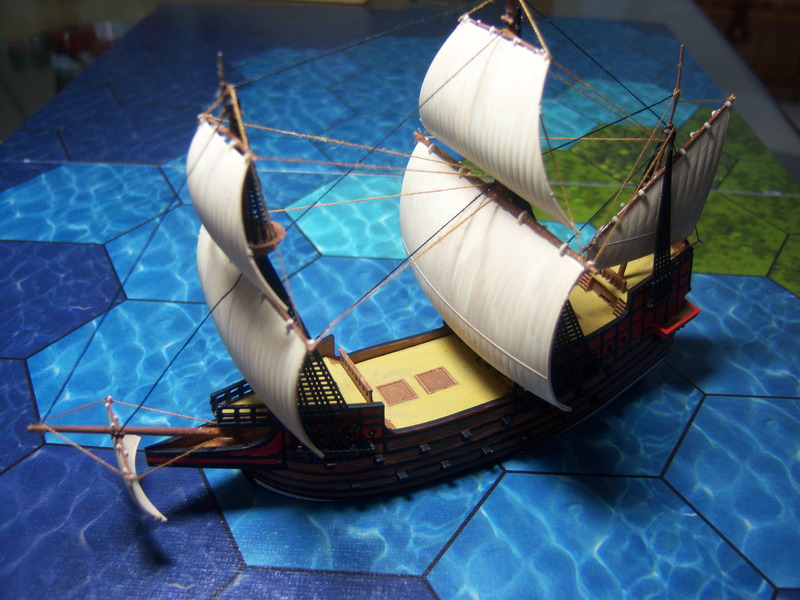 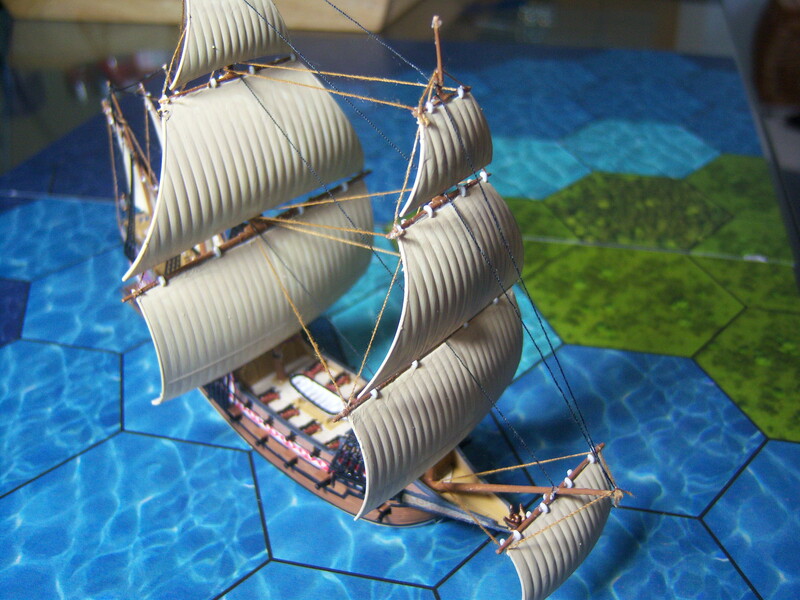 The ships are on the boards that come with the game. 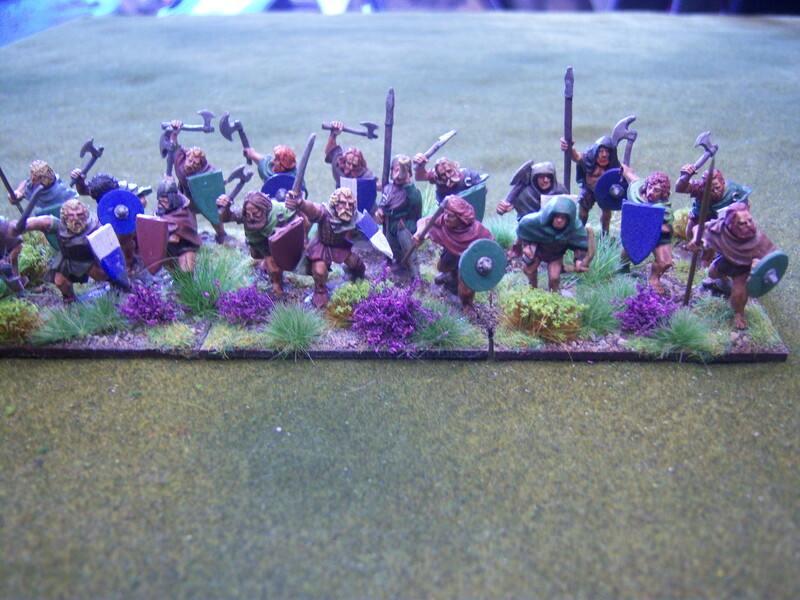 Might have gone a little OTT on the basing but I ordered some heather plants and wanted to see what they were like. 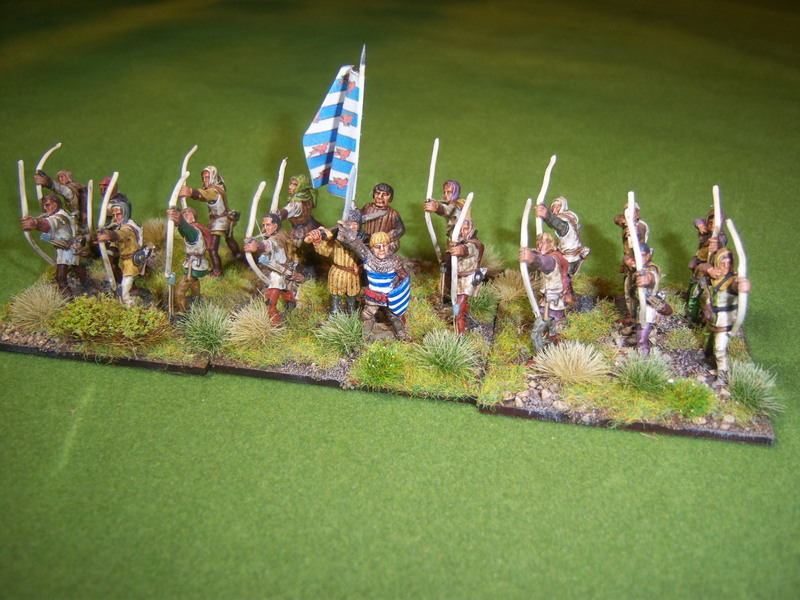 When I recently received my order from Old Glory of war 1812 figures, I had at the same time also ordered some of their medieval Scottish to give a bit of variety to my Schiltrons for the Scottish wars of independence. 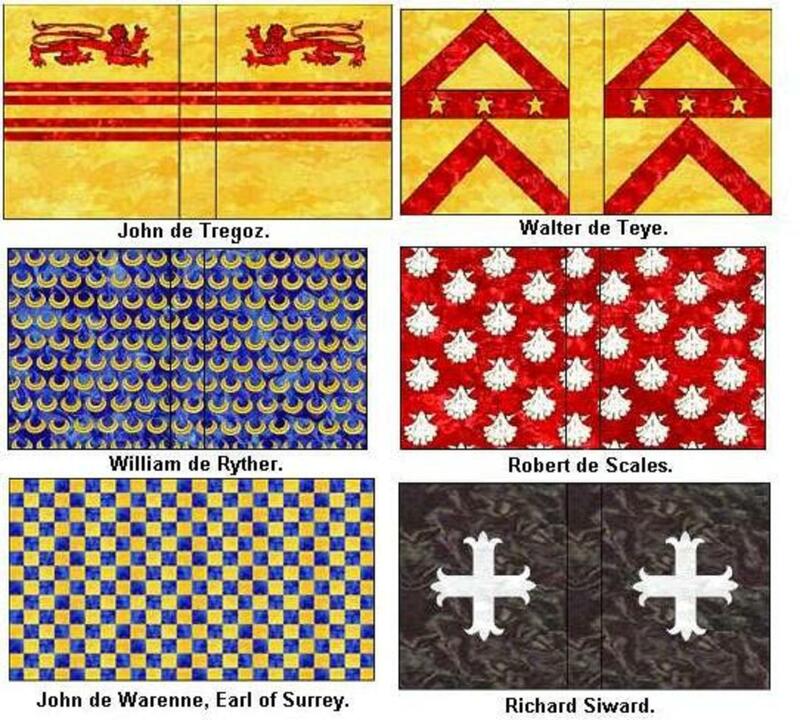 With the vote later this year for independence and the associated reinvigorated enthusiasm for the period, I intend to paint the odd unit. 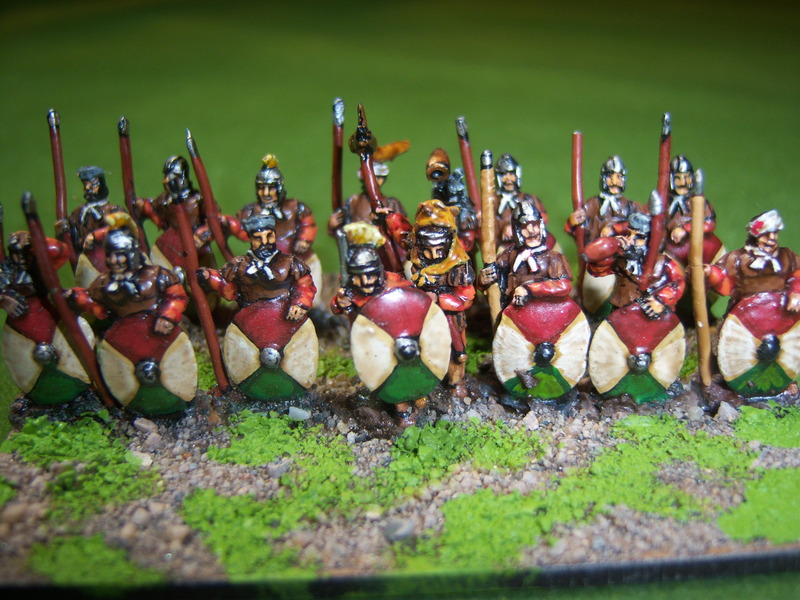 I do not want to do a demo yet for this era for at least a couple of years so I am really just stock piling painted units for the moment. 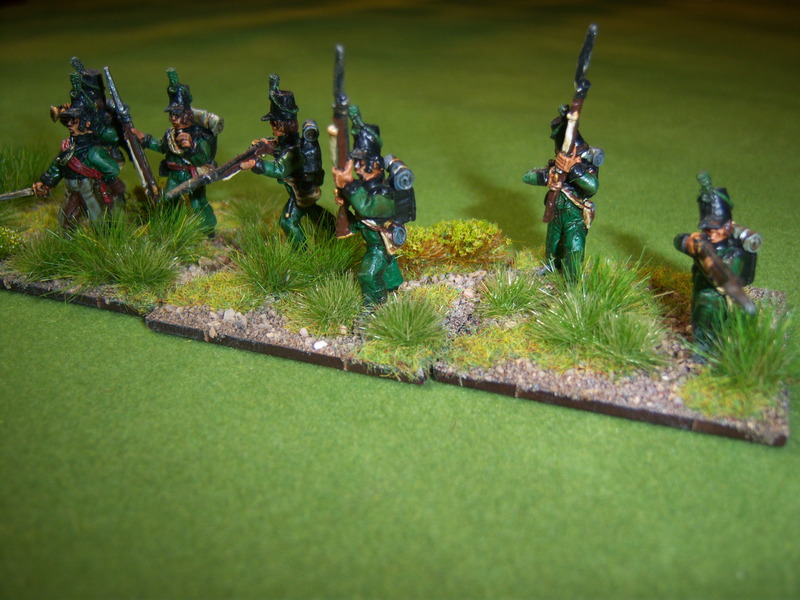 I have over the last few weeks started to paint them up. 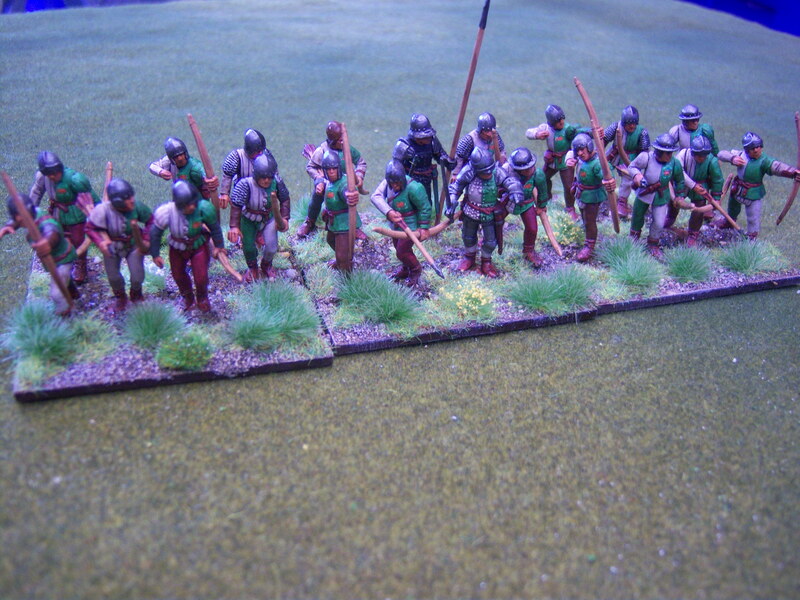 My current units are made up from EBOB miniatures, these are nice but slim, expensive and unfortunately poor delivery (at least with my last 2 orders). 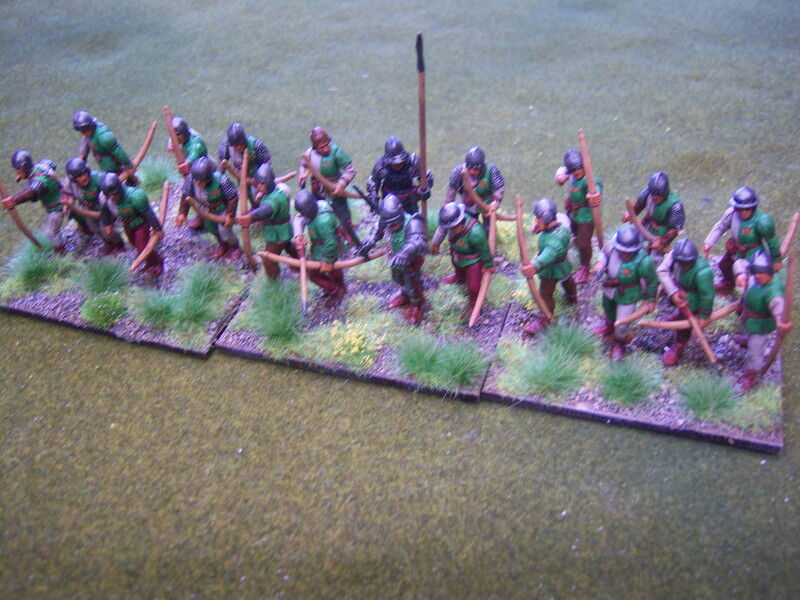 I also have some very old Ral Partha/citadel, these are too small really, true 25mm but I just love the detail so I tend to mount them on a small piece of mounting card to bring them up to the height of the others. 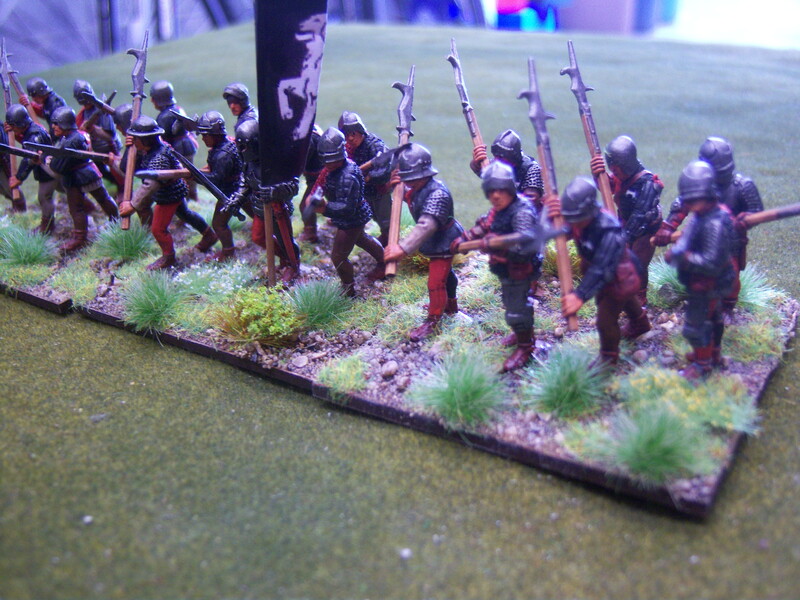 Once based they do not stand out too much, I hope. 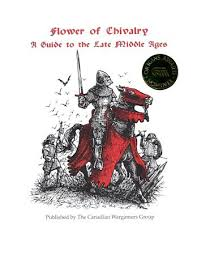 I intend to build my armies around the DBA army list for campaign gaming but will be using the Canadian Wargames Group rules “Flower of Chivalry” for the table top battles. 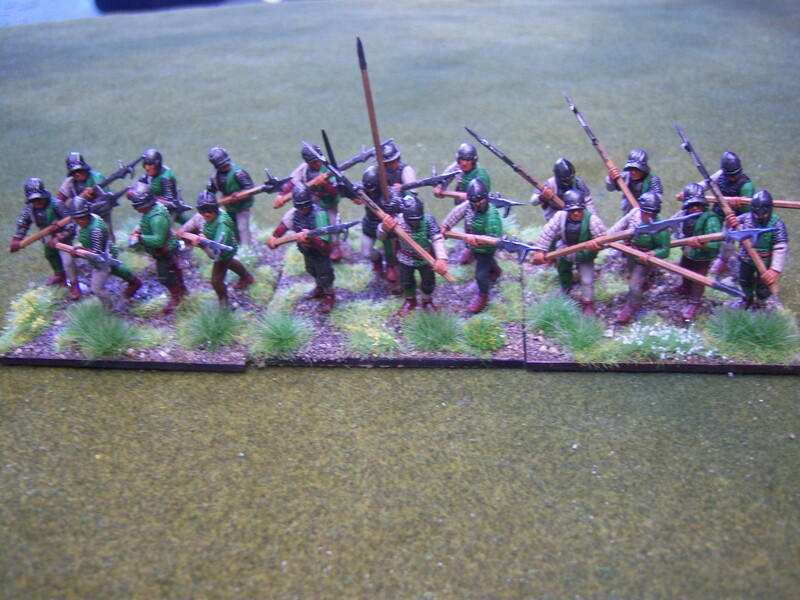 I will post units as and when they have been painted and based. 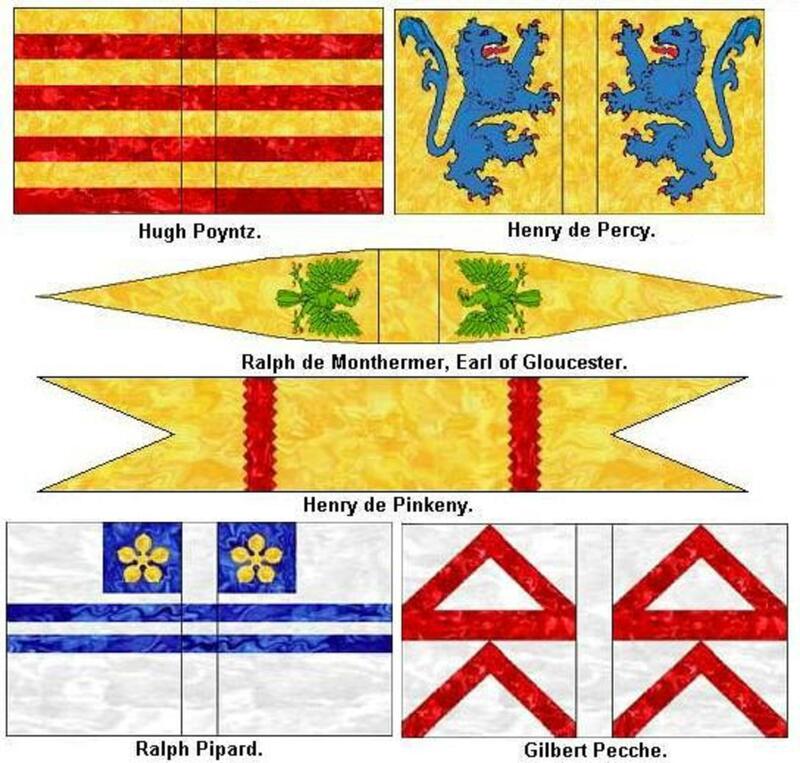 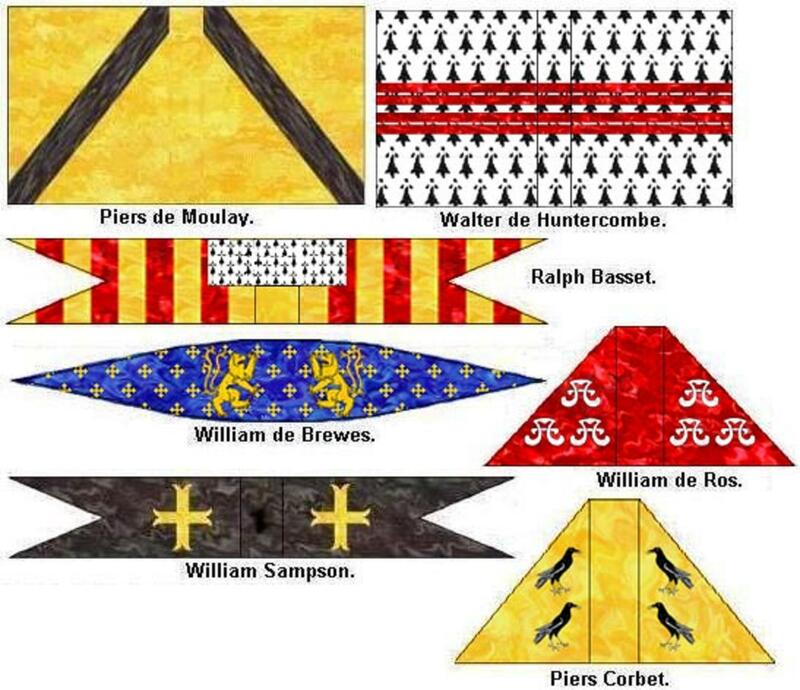 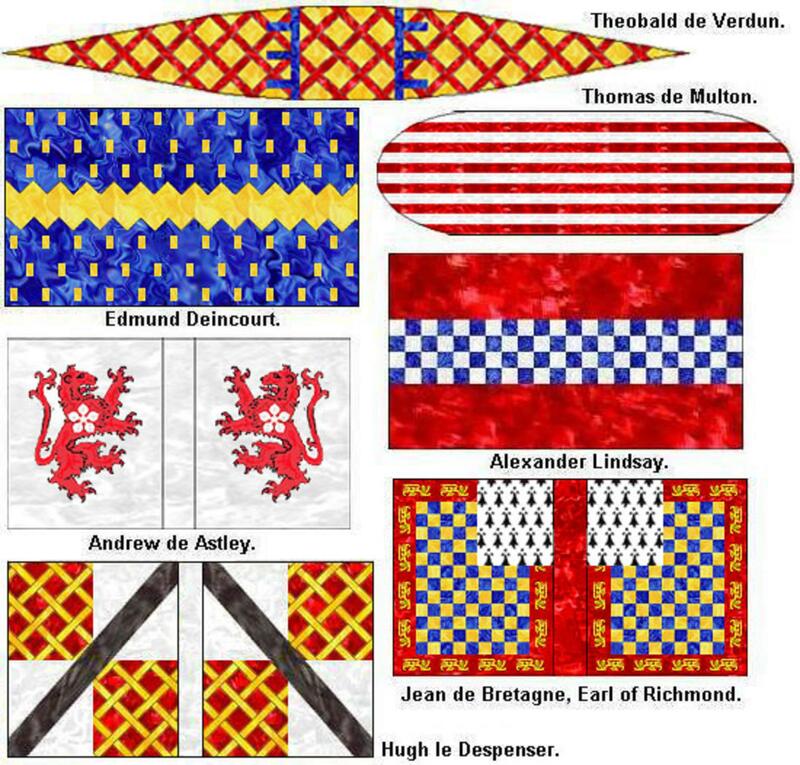 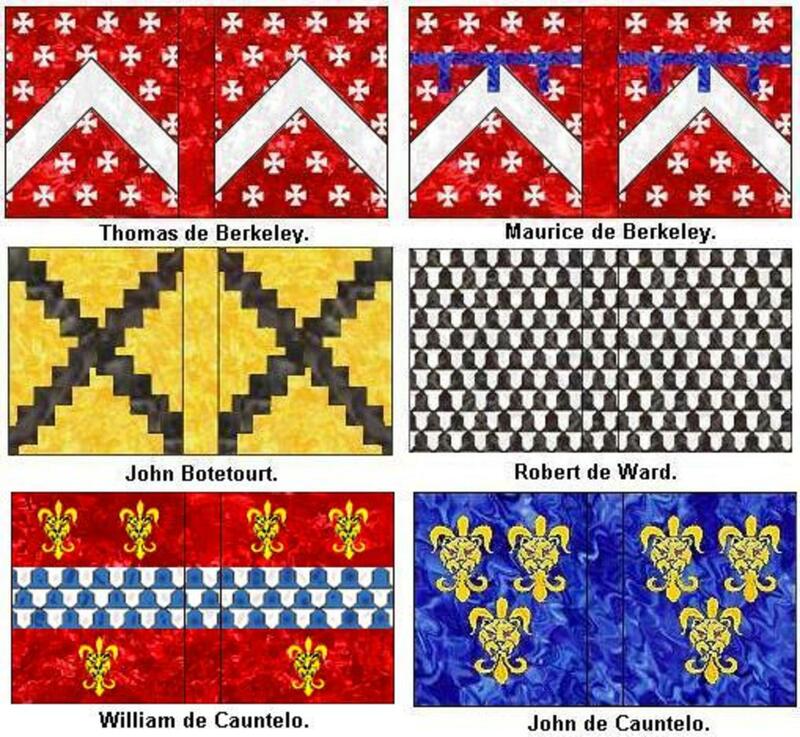 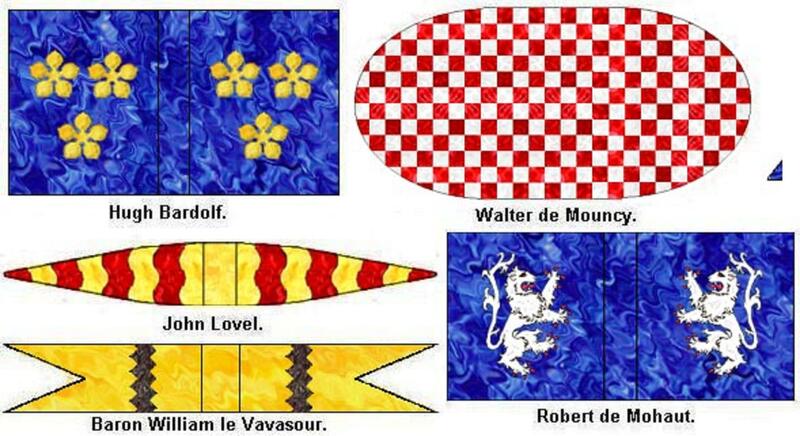 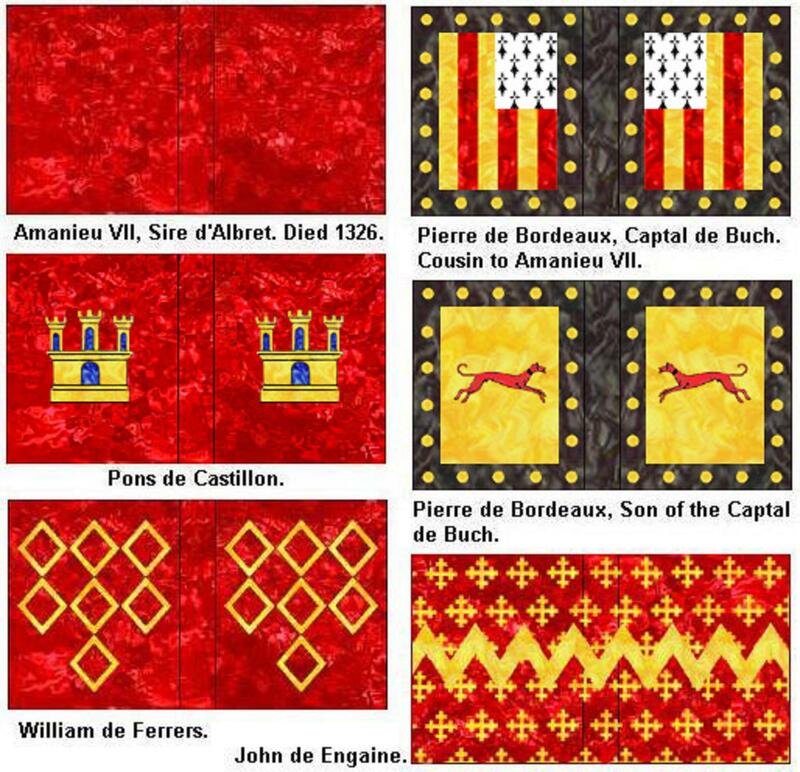 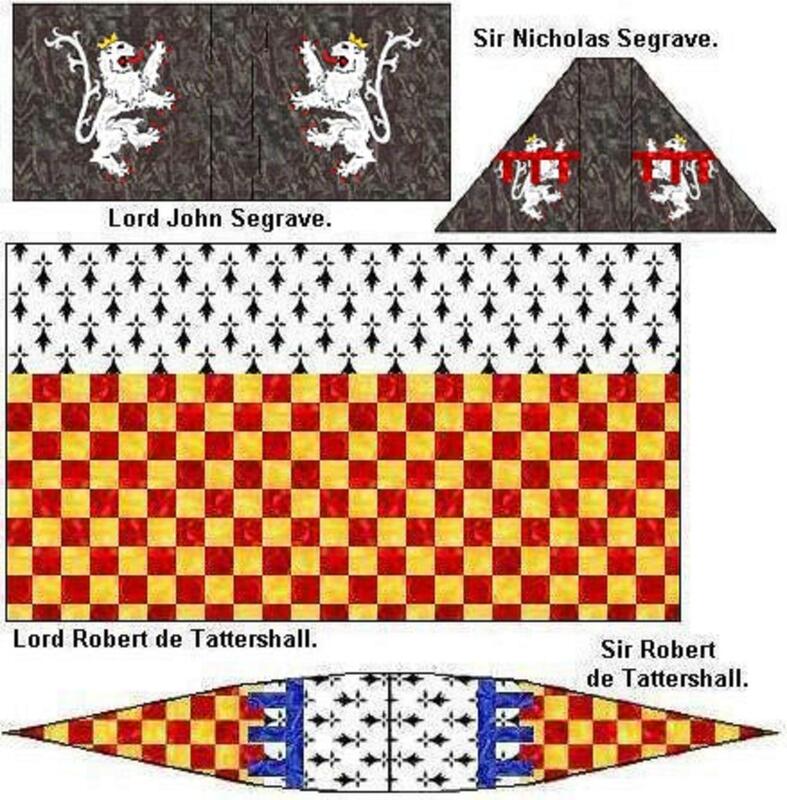 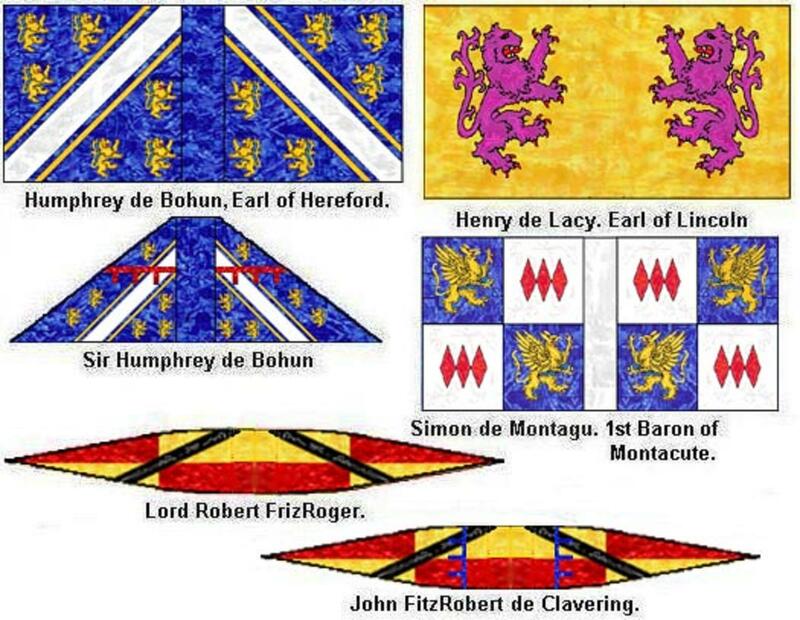 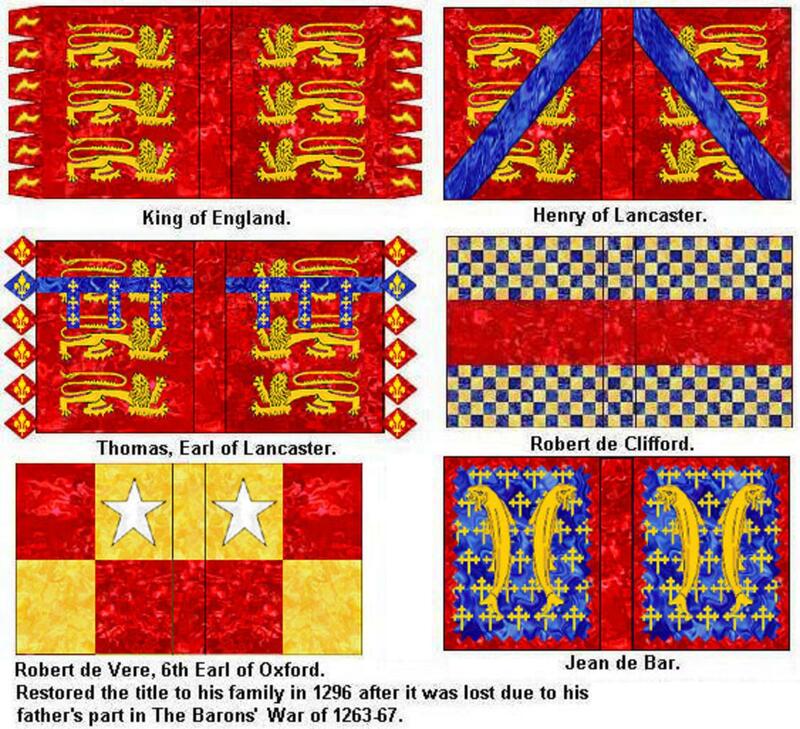 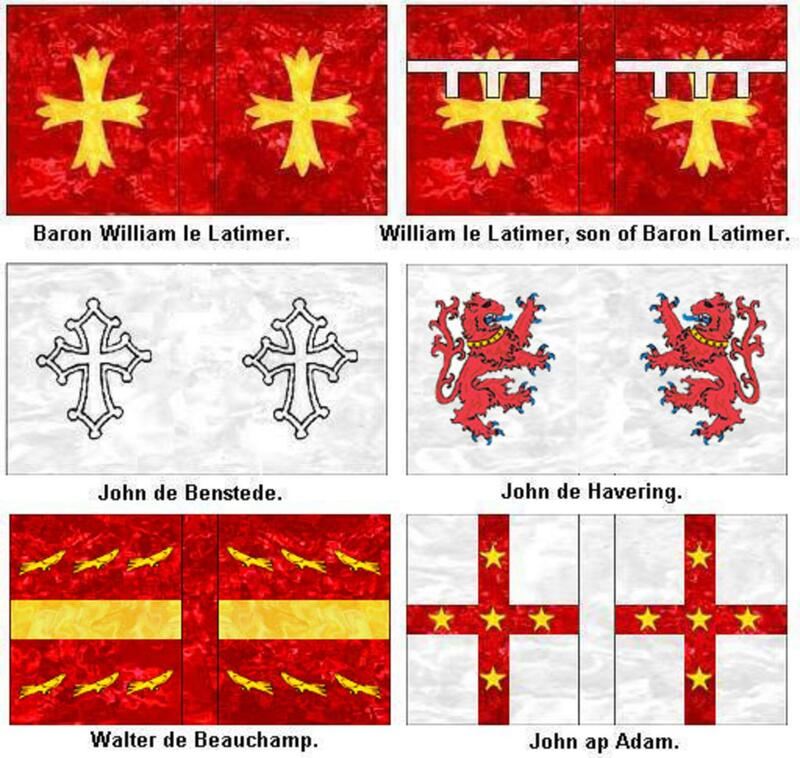 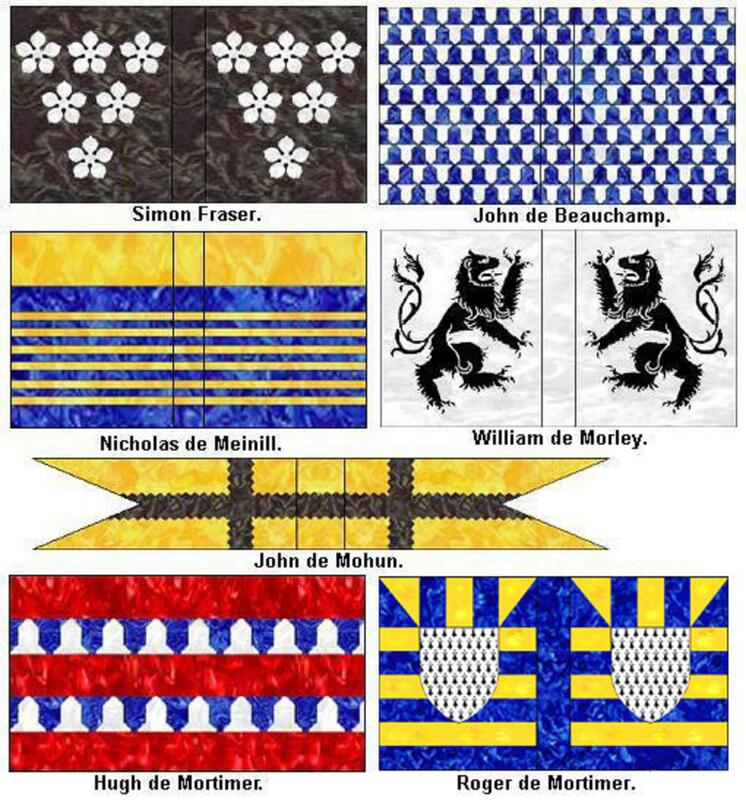 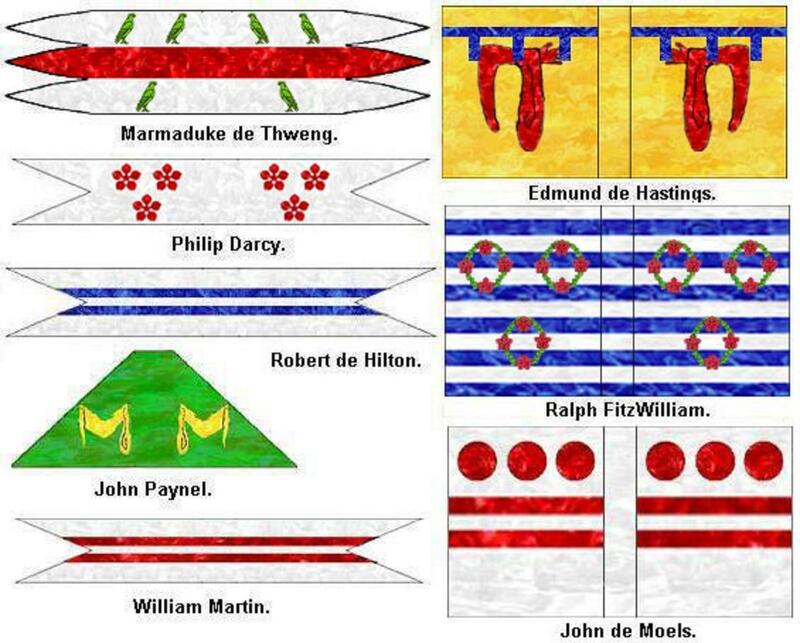 Here are some flags of knights that were at the battles. 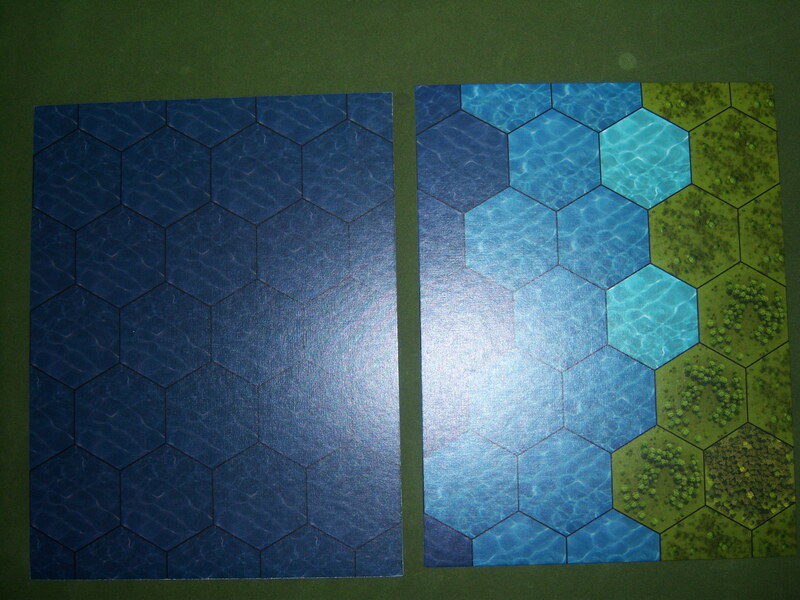 They may need resizing. 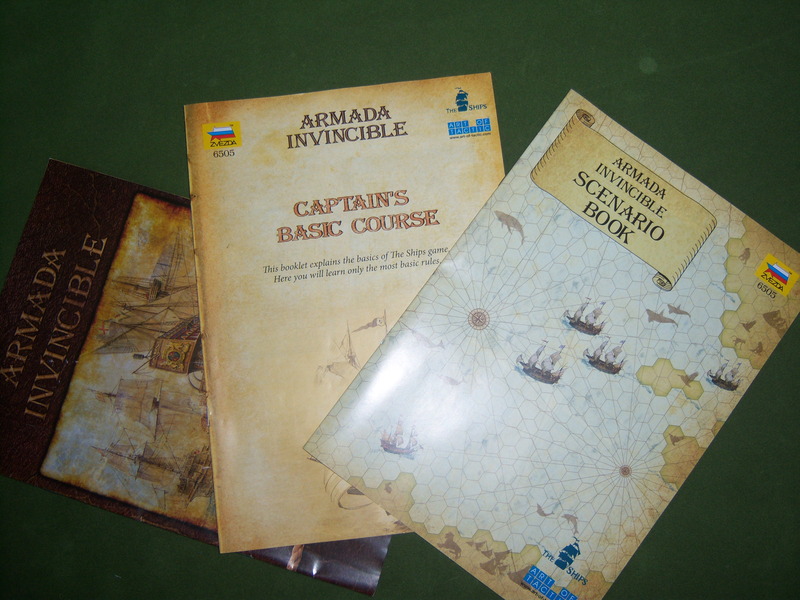 They were a free download from a site but unfortunately I have forgotten which one? 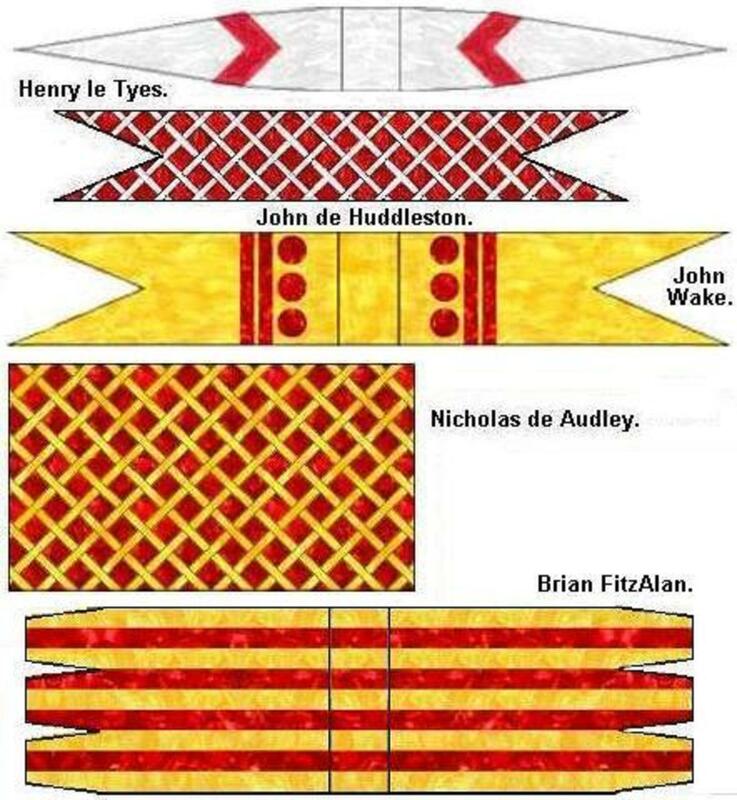 If anyone knows please email me as I remember it being a great site and they deserve all publicity.